CAST — Showgirls! The Musical! April Kidwell is is a poor backwoods girl trying to make it in Different Places but she’ll never reveal the truth that she is just one generation from poor white trash. She began her theatre career at the ripe age of 16 when her teacher suggested she get on all fours and sing “Pet Me Papa” from Guys & Dolls. She thanks every man who ever tried to play Just the Tip. Her breasts are real, and yes, they’re a D cup. She has a positive outlook on life. And she is excited for the day when she’ll finally get to star in a Courtney Love Biopic. She loves pole dancing, showgirls, Elizabeth Berkley, lentils, Goddess Baths, writing sketch comedy, making candles, essential oils, reusing jars, thinking about gardening, the Hitachi Magic Wand and Deep Spiritual Experiences of Being and Accessing Ancient Knowledge of the Universe Through Opening Her Pineal Gland. She thanks Elizabeth Berkley for creating the Rocky of all Strippers, Amanda Bassa and Shockra Dance Studio for generously sharing their skills, space & time, Curtis Peel for his AMAZING Showgirls! The Musical! Marketing Campaign and The Mediumface and Futurist families for all their constant love and support. Broadway: Joseph...Dreamcoat. Off-Bway: Nice Jewish Girls Gone Bad(Zipper Factory), Pinkalicious(New World Stages). National Tours: Rockband, Live!, Wizard of Oz. Regional: Rent (Maureen), Gypsy (Mazeppa). Rori has also appeared in the NYC Fringe (The Johnny) and Midtown International Theater Festivals(Between the Bricks), Darien Lake Theme Park, America's Got Talent(Witches in Bikinis), and numerous productions of The Rocky Horror Show(Magenta). As a singer/songwriter, Rori is currently writing the rock musical, "Siren’s Den.” Next up: Grease(Rizzo) at Roxy Regional, Summer 2014! This show is dedicated to Grammy, who would definitely not approve, and Grandpa, who would love every second. returned for its 2013 Off-Broadway incarnate, "Bayside! The Musical". Other credits include "RENT" at Syracuse Stage and Judas in "Spears: The Gospel According to Britney". He has a BFA in Musical Theater from Syracuse University and loves chaos. Thanks to the MediumFace crew, his family, and everyone else who has helped him get his groove back - this has been the greatest year. Follow him @iamjohnduff on all practical social media outlets. 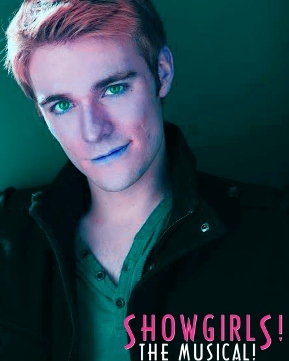 Philip McLeod is more than overjoyed to be a part of the Showgirls family. A native of Ohio, Philip earned a degree in music education from the College of Wooster before moving to DC. After three years of acting in DC, he made the decision to take it to the next level and move to New York where he has been for only a few months now. Some of Philip's favorite roles include Claude (Hair), Melchior (Spring Awakening), Mercutio (Romeo and Juliet), and Freddy Eyensford-Hill (My Fair Lady). As always, he would like to thank his mom, Cam, Logan, Hayden, Nicole, and Hillary for more than they could ever know. Amanda Nicholas is a graduate of NYU, CAP21 and is positively bouncy at the prospect of reprising her role as Mittens/Penny in Showgirls. She feels so lucky to have found such a wonderful family of talented perverts, and she hopes the hilarity never ends. Favorite roles include Ms. Teddy Spelling Carosi the Duck in "Bayside! The Musical! ", Christina the Method Actress in "Direction: A New Web Series," and Rapunzel the manic-depressive princess in "Into the Woods". Hugs and booby cuddles to all! When watching the movie Showgirls a few years back he never thought he would be in a musical version of the show, all he was thinking was "Oh, God, whose idea was it to make this a movie?" But here we are! You never know where life's going to take you. A recent transplant from Virginia, Glen is excited to be making his New York City debut with this incredible cast and creative team. Favorite roles include Ichabod u/s (The Hollow) at The Signature Theatre, Frankie (Forever Plaid), Riff Raff (Rocky Horror), Link (Hairspray), The Mad Hatter (Alice in Wonderland), Laurie (Little Women the Musical), and CB (Dog Sees God). Much love to family and friends! "Bob and Tobly McSmith are the Bonnie and Clyde of stick-a-firecracker-in-it comedy"- Cultural Capitol. Bob and Tobly are grabby weirdos that met a Hooters. Bob was working there and Tobly was crying in the bathroom and have been writing and performing together for 10 long years. They are founding members of the sketch group/production company MediumFace, writers/directors of“Bayside! The Saved by the Bell Musical!” and "JonBenet! Murder Mystery Theater!" (with Mary Crosbie and April Kidwell). Bob and Tobly have been nominated for a cornucopia of honors including “Most Likely to Improve Sexually” (Tobly, 5th Grade) and “Class Masturbator” (Bob, 1st-12th Grade). Courtney has her MFA in Directing from Southern Illinois University, BFA in Music Theatre from The Hartt School, and BA in English from the University of Hartford. She most recently choreographed the workshop of Spears: The Gospel According to Britney here in NYC and was the SDC Observer for the pre-Broadway workshop of Big Fish, directed/choreographed by 5-time Tony winner Susan Stroman. Courtney was previously full-time faculty at SIU teaching dance/acting and directing/choreographing productions and has directed, choreographed, and performed professionally across the nation at theatres such as Barrington Stage, Arizona Broadway Theatre, The Little Theatre On The Square, McLeod Summer Playhouse, and the Broadway Palm.